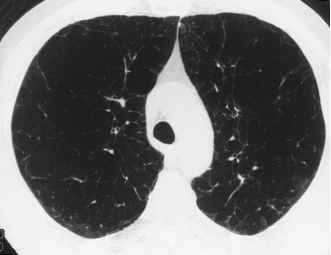 Figure 12 MHCT pulmonary angiography multiplanar reconstruction image. Coronal 2D reconstruction from CT pulmonary angiography study shows nonocclusive intraluminal thrombus within common basilar trunk of left lower lobe pulmonary artery (black arrow) surrounded by contrast. Occlusive thrombus is seen more distally within the lateral basilar segmental and subsegmental branches (curved white arrow). Note absence of significant stairstep artifacts. 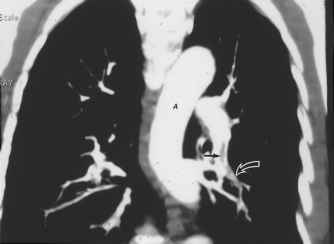 A, aorta. habitus or inadequate kilovolt and milliampere settings, one has the option to combine data from additional detectors to improve the image quality. For example, if the initial images are difficult to interpret due to streak artifact from hardware or foreign body, reconstructing these images with data from adjacent detectors will decrease the amount of artifact observed.